A pretty little vintage girl image, I have for you today! 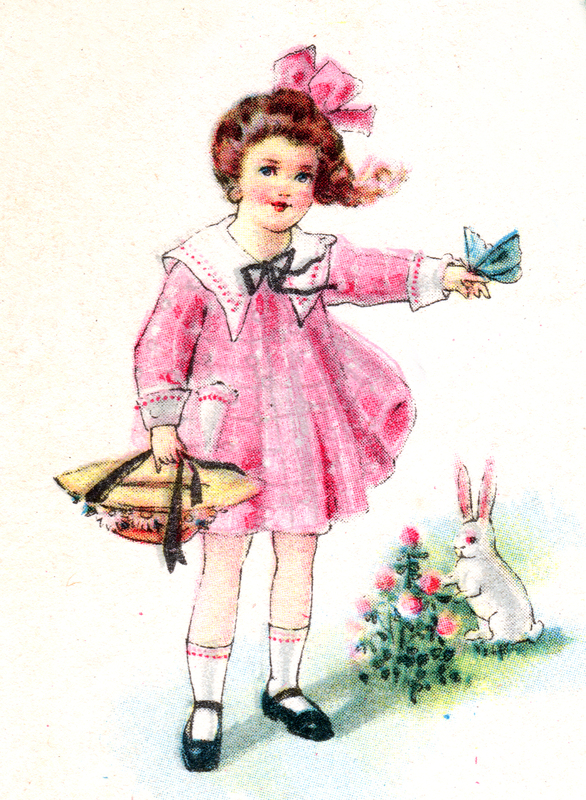 It seems to be an Easter/Spring image as she is posing in her lovely pink dress and hat with a butterfly and bunny right at her side. Her face is just darling in my opinion since she reminds me of my little princess :)I could see her being used in a multiple of projects and crafts by all you creative gals! Awwww, what a sweetie…….the little girl and YOU for posting this. Thank you for sharing this with all of us. Oh Keren I’m such an old fool, I hadn’t looked at this absolutely beautiful girl when I sent you that comment, was referring to the doves/flowers cluster. But this is so pretty, wish I had some ink so I could print it out right away to make something with it. This is very special. Thanks so much for sharing. Makes me feel like Spring all over. Would be so pretty to make cards with and many other special items. My head is spinning thinking of them. You’re right her face is so pretty, innocent. You give us so many wonderful images, thanks so much for sharing all this with us.